Powered by two alkaline AAA batteries, the compact monotron can be held in one hand. 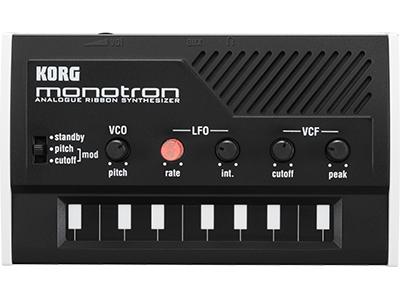 Although small enough to easily carry with you, the amazing monotron is packed with KORG’s legendary analog technology, generating thick and powerful sounds. Concentrating on the most important sound parameters, the controls have been streamlined as much as possible. The panel contains only five knobs and one switch. 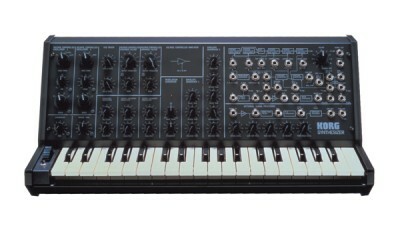 With this level of simplicity, now anyone can easily enjoy the world of analog synthesizers. 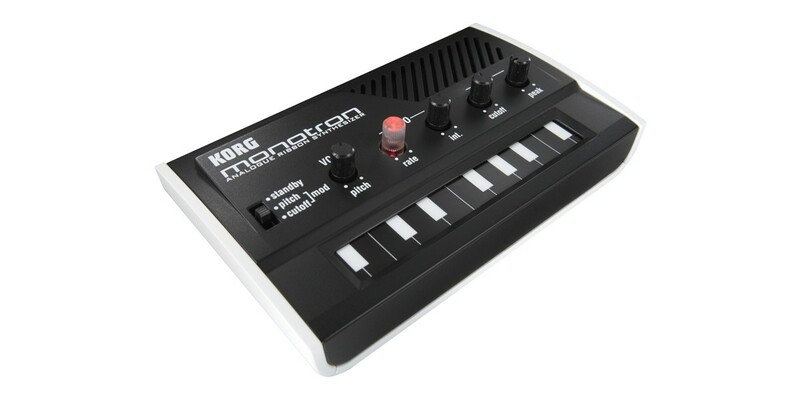 Borrowing the enjoyment of performing with a simple touch from Korg’s wildly popular KAOSS products, the monotron’s ribbon controller keyboard takes this ease of use even farther. Simple finger gestures can produce expressive effects such as vibrato and glide. Used in a band, you can expand your possibilities by harmonizing with another instrument – or taking center stage for a monotron solo! The monotron’s circuit is radically simple: one voltage-controlled oscillator, one voltage-controlled filter, and one low frequency oscillator. Since each knob directly applies a specific change to the sound, the process of sound creation is intuitive, and instantly understandable. Simple is best. Gone are the deep lists of presets and parameters typical of today’s synthesizers. Instead, the monotron encourages exploration and experimentation. The monotron provides the joy of sonic creativity that’s at the heart of analog synthesis, making it an ideal choice for someone who is new to synthesizers, or for musicians who wants to expand their sonic palette. 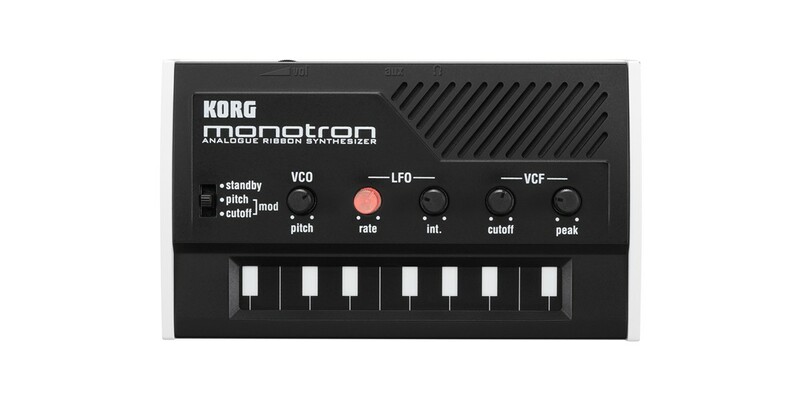 The monotron uses the same highly acclaimed VCF circuit as KORG’s classic MS-10 and MS-20 semi modular synthesizers. Originally released over 30 years ago, these instruments are still coveted today for their aggressive, dynamic filters. 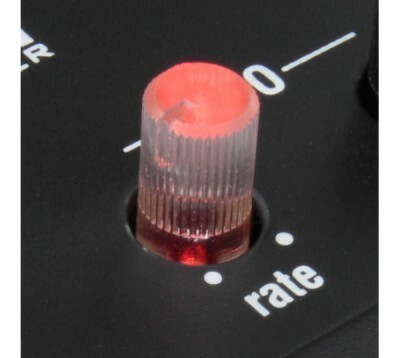 The VCF Cutoff knob sets the frequency or tone of the filter; the VCF Peak knob adds emphasis. A powerful filter is an essential aspect of any analog synthesizer, applying dramatic tonal changes to the sound, and projecting an intense personality that will stand out in any live performance. You can switch the LFO to control either the oscillator pitch or the filter cutoff frequency. 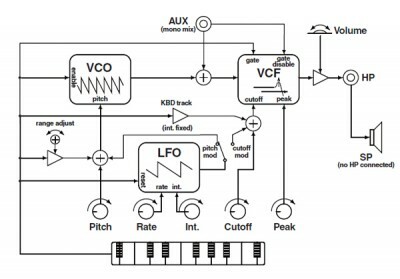 Both LFO Rate and LFO Intensity knobs are provided. As you turn the LFO Rate knob – featuring an embedded LED – the speed of the modulation effect and the speed of the blinking LED will change in tandem. Turning this knob can add another level of impact to your live performances. A miniature speaker is built into the monotron. Along with the battery operation and compact size, this feature allows you to enjoy the monotron anywhere, at any time. The ultimate in compactness, this system brings you new possibilities for performance. There’s also a headphone output that you can use when creating sounds at home, for recording, or for connecting to an amplifier or PA system.